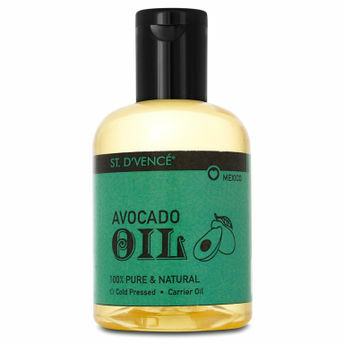 St. D'vencE 100 % pure and natural avocado oil is a rich source of amino acid, essential fatty acid, and vitamin A, D and E providing adequate moisture to the epidermal layers and nourishing the skin while deeply penetrating into the scalp providing effective results. It also acts as a shield from harmful ultraviolet rays acting as a useful anti-tanning and sun-burn therapy. This cold pressed natural oil is ideal for daily use and can be used as a massage oil, aromatherapy oil or carrier oil. It blends seamlessly with essential oils or any mix ins. Create your own DIY scrub, mask or aromatherapy solution with this versatile oil. Rich in ethically sourced ingredients which comes with a host of skin, hair and health benefits. It works excellent as a skin nourishment and can be used as a face and body moisturiser as well. This cold pressed natural oil, if applied regularly, improves blood circulation to the scalp and stimulates complete nourishment to the scalp.